A native of London, England, Juliana Scholle started playing piano and harp within a couple of months of each other when she was 12 years old. After 2 years of playing and receiving consistent top placements in competitions, Juliana became a piano and harp student at the Royal College of Music’s Junior Department. She moved to the Phoenix Metropolitan Area in 2007 and studied with Ms. Alla Yashneva and Maryla Tiran, both of which helped her receive placements at music schools across the country in both instruments. 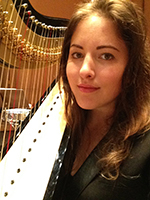 Juliana recently received her degree in Harp Performance from Arizona State University’s School of Music. A diverse and musical player, Juliana has performed with the Flagstaff Symphony Orchestra, the ACME Music Ensemble, the ASU Symphony Orchestra and the ASU Lyric Opera Theatre Orchestra among other ensembles. Since attending ASU, she has enjoyed working with Joshua Hill, Robbie McCarthy and Vassilios Makavos on new compositions involving the harp. At ASU she has studied under Dr. Lynne Aspnes and Julie Smith Phillips, and has had performance coaching from Stephen Hartman to prepare her for two independent recitals she did this school year. Juliana also continued her piano education intermittently throughout college, voluntarily accompanying and collaborating with different students and ensembles. She is also a member of the Phoenix Chapter of the American Harp Society, the American String Teacher’s association and the Suzuki Institute of the Americas, for which she is a registered teacher. Outside of her educational pursuits, Juliana likes to compose, play violin, paint and write whenever she gets the chance. Tune in – going live in 5 minutes! Jane N’ The Jungle will be appearing on the Independent Artist Spotlight Show. AZRadio.Live. Should be an.. Registration now OPEN! Music summer camps! Call or email today for more information on how to register. Camps for ages 3-18. See our website..
Don’t know what to do with the kids this summer? Want them to get extra lessons, or learn a new instrument? We have some great summer camps..
First show happening at The B Side! Super excited!! Looking for a camp during spring break? Sign up for our musical all-day camp March 11-15th 9am-3pm All ages welcome and no experience necessary!..